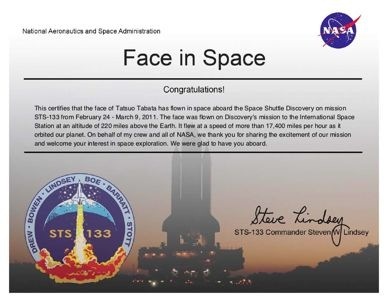 This certifies that the face of Tatsuo Tabata has flown in space aboard the Space Shuttle Discovery on mission STS-133 from February - March 9, 2011. The face was flown on Discovery's mission to the International Space Station at an altitude of 220 miles above the Earth. It flew at a speed of more than 17,400 miles per hour as it orbited our planet. On behalf of my crew and all of NASA, we thank you for sharing the excitement of our mission and welcome your interest in space exploration. We were glad to have you aboard. The next mission STS-134 is currently scheduled to launch April 19, 2011, and you can still take part in the project. Note added later: The mission STS-133 was the last one the Discovery performed. Read the related stories "A Bittersweet Finale for the Discovery" in New York Times (March 9, 2011) and "Space shuttle Discovery lands in Florida, capping its 39th and final mission" in Scientific American (Mar 9, 2011).